President Buhari is still putting close to his chest the final decision on whether he would extend Idris’ tenure or appoint a new IGP. 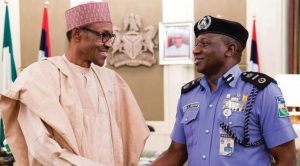 As the tenure of the Inspector-General of Police Ibrahim Kpotun Idris expires next week, on reaching the mandatory retirement age of 60, President Muhammadu Buhari may soon appoint a new IGP, following his promise to act on the matter. Buhari had said in an interview with Arise TV that though the choice of a new service chief evokes unnecessary competition, he would act on the matter of Idris’ imminent retirement. Idris’ tenure expires on January 15, 2019, when he turns 60. President Buhari is still putting close to his chest the final decision on whether he would extend Idris’ tenure or appoint a new IGP. If the President has to choose a new IGP, sources said he may look in the direction of the South-east. The outgoing IGP Idris is from Lavun, Kutigi in Niger State. In the South-east zone, there are two known top officers, one a Deputy Inspector-General of Police, a woman, and the other an Assistant Inspector General of Police. Both of them were course mates and promoted into the AIG rank at the same time. DIG Peace Ibemere Abdallah, who is at present the DIG Force Criminal Intelligence and Investigation (CIID), Abuja, is said to be a highly effective, versatile and professional police officer. One top officer said she is no less qualified than any other but given the increasing crime wave and sophistication of criminals, believed to be mostly men, the question some have asked is whether the country was ripe at present for a female IGP. The other top officer from the South-east is Assistant Inspector-General Godwin Nwobodo, who is currently in charge of the Nigeria Police Border Patrol Force. He is said to be another thoroughbred professional police officer, highly cosmopolitan and detribalised. Though an Igbo man, Nwobodo was bred in Yorubaland where he had his elementary, secondary and university education in the South-west and also performed his mandatory National Youth Service scheme in the zone. AIG Nwobodo was born on 12 August 1959 to the family of Mr. and Mrs. Samuel and Margret Nwobodo of Aninri Local Government Area, Enugu State. He completed his primary school education at Alafia Institute (Free Section) Mokola Ibadan, Oyo State in 1973 and obtained his WASC and HSC at Olivet Baptist High School, Olivet Heights Oyo in 1978 and 1980 respectively. He obtained a B.Sc (Honours) degree in Biochemistry in 1983 from the University of Ibadan. He served in the NYSC scheme in 1984 in Ondo State. He enlisted in the Nigerian Police Force effective December 31, 1984. Since enlisting in the police force, Nwobodo has acquired more knowledge and degrees. He now holds an LL.B, BL (Law), M. Sc in Legal Criminology and Security Psychology, as well as MSS (Masters Strategic Studies) both from the University of Ibadan, effectively equipping him as a complete intelligence and robust crime-bursting and combating officer, versed in law and criminology. Nwobodo has held very sensitive positions and performed critical assignments. He was the Commissioner of Police (Courses) at the Nigeria Police Academy, Kano, before his recent promotion to the rank of AIG.